The Possession: Don’t Open the Box! I was so happy when I saw The Possession take the number one spot at the box office two weeks in a row. It was the little horror movie that could, yet people seemed completely shocked when that happened. They shouldn’t be. When a screenplay agent visited the last coworking studio I was at, Paragraph, he did not recommend doing a screenplay on spec unless it was a low-budget horror movie script because those were always sellable. He also said writers shouldn’t slum and try to do a horror script to break into the business. You really have to believe in your material and bring something new to the table to impress today’s jaded horror fans. Though I was impressed with The Possession’s success, I ended up being tardy to see the movie. It’s on its way out of the theaters now, and I think part of my problem was finding someone to see it with. Everybody had already gone when I wanted to see it, and it’s no fun seeing a horror movie if you don’t have somebody to scream with. This ended up being the second feature in me and Valerie’s horror movie weekend. While watching, Valerie said she always learns something in horror movies, and within the very first few minutes of seeing this one, the number one lesson was apparent: Don’t open the box. The Possession has an original premise that reminds me of Joe Hill’s Heart-Shaped Box (where the protagonist goes to great lengths to secure a haunted object advertised on the Internet). The movie opens with a scary scene where an older woman confronts an antique wooden box on her mantel. It emits spooky sounds like a Goblin song from a Dario Argento movie, and it’s pretty obvious who or what is going to win in this matchup. Next, the audience is introduced to a fractured family—mom (Kyra Sedgwick) and dad (Jeffrey Dean Morgan) have divorced and their two daughters, Hannah (Madison Davenport) and Em (Natasha Calis), are shuffled between two separate residences. Dad has just moved into a new prefab house, and on the way there, the family car passes a yard sale. The girls convince their father to stop—after all, what can be more pleasurable on a fall day than a yard sale? The girls play dress up and frolic, but then the younger daughter, Em, finds the antique box containing the dybbuk and falls under its spell immediately. She convinces her father to buy it, and with that and a whole load of other items, the family makes out like bandits, paying only fifty dollars for everything. Once the family gets everything home, Em asks for help opening the box, which seems to be impossible as it has no seams. Eventually she’s able to do it by herself in her room, and the box opens to show off all manner of ugly things, like desiccated moth bodies, a huge yellowed tooth, and an antique ring that Em immediately slams on her finger. It’s such an old-lady ring, and Valerie and I were both surprised that her parents didn’t see and comment on such a thing, especially when it starts discoloring her hand like a spreading bruise. Em begins exhibiting unpleasant personality traits that are not very becoming to a little ten-year-old girl, such as stabbing her father with a fork between bites of pancake, tackling a kid who takes off with her box and beating him senseless, and presenting her mother’s boyfriend with a disgusting gift. Strangely enough, it’s her part-time father who is troubled by this behavior when it was his absenteeism that brought about the divorce in the first place. Her mother blames all the misbehaving on the divorce. As the undesirable behavior escalates in Em, her father is denied access to her after what looks like an incident of child abuse. But he knows something is seriously wrong with his little girl and goes to find help first at his university, where he coaches basketball, and then with a group of Hasidic Jews in Borough Park, Brooklyn. (Another lesson we learned: Help is near our neighborhood. If a dybbuk ever threatens us, we now know where to go.) 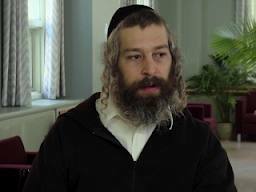 He’s turned down by the shul, but one rebel Jew, Tzadok (Matisyahu), agrees to help him. By this time, Em’s mother realizes something is up and has taken her daughter to the hospital, where there’s further confirmation that something’s not quite right. This ended up being one of several scenes that seemed liked paler versions of The Exorcist. The only difference in the exorcism scene at the end was the religion used, but this wasn’t enough to make it new or scary. Also, I felt there was some cheating. The religious authority said the dybbuk was attracted to innocence so some of the possession choices the spirit made were quite puzzling if that’s the case. Because of this, the movie ended on a rather blah note for me, which was disappointing after it had been going along so well. Endings—they’re so hard to get right.